Ocean City blocked access to the boardwalk between Sixth Street and Eighth Street on Wednesday, Oct. 14, 2015. A detour will be in place for about four months while the entire substructure and deck is demolished and replaced. 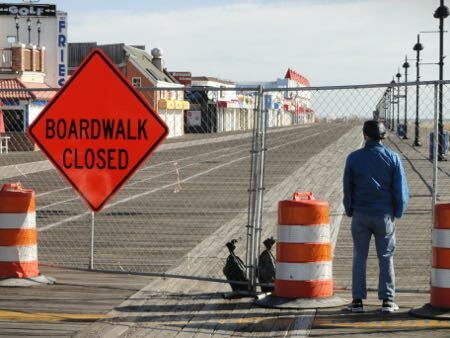 Two blocks of the Ocean City Boardwalk closed on Wednesday morning as a contractor prepares to demolish and reconstruct that stretch of the iconic walkway. A new detour sends Ocean City Boardwalk pedestrians and bicyclists to Atlantic Avenue between Sixth and Eighth streets. The work is part of the third phase of a multi-year reconstruction project that will replace the boardwalk between Fifth Street and 12th Street. The project this off-season will replace the entire substructure and decking of the boardwalk between Plaza Place (just north of Seventh Street) and Eighth Street. A similar project last year took four months — with a block and a half of the boardwalk closed from mid-October to mid-February. Runners, pedestrians and cyclists are being detoured off the Boardwalk at Sixth Street and Eighth Street and sent down to Atlantic Avenue. The detour adds about 0.41 miles to a run the length of the boardwalk (from 2.45 miles to 2.86 miles). Runners could also venture onto the soft sand to cut the distance. 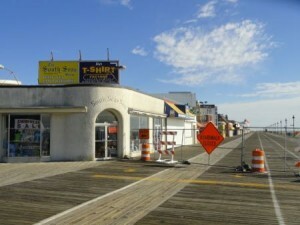 The boardwalk ramp at Eighth Street and stores to the south will remain open during the reconstruction work. The remaining segment between St. James Place and Sixth Street is 0.58 miles (or a round-trip of 1.16 miles). 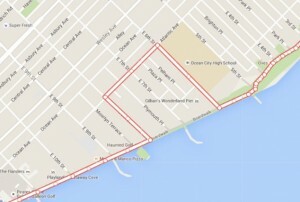 The stretch between Eighth Street and 23rd Street is 1.64 miles (or a round-trip of 3.28 miles). The project work runs only in the off-season and began at Fifth Street in fall 2013. It will continue from Eighth Street to somewhere past the Ocean City Music Pier (2016-17), Music Pier to somewhere past 10th Street (2017-18), and to the finish at 12th Street (2018-19). Walters Marine Construction of Ocean View underbid the contractor for the first two phases of the project, Fred M. Schiavone Construction, and eight other companies with a winning bid of $1,888,347. The project will include adding two more access points for the disabled and a new pavilion on the ocean side of the boardwalk. Some opt for a soft-sand detour between Sixth Street and Eighth Street. The project calls for the use southern yellow pine for the decking. The city has long sought an alternative to pine for its boardwalk. The soft wood splits, cracks and exposes nails or screws after relatively short periods of time. The city has studied and tested many alternatives but has found none both suitable and cost-effective. The pine that will be used is thicker (three inches) and sturdier that the pine used on other sections of the boardwalk, and the recently completed sections of new boardwalk have held up well. A stock of southern yellow pine that had been stored in Ocean City since the settlement of a lawsuit with the Louis J. Grasmick Lumber Co. of Baltimore in 2009 was used up in last year’s project. Treated wooden pilings will replace the crumbling concrete substructure of this part of the boardwalk. Sign up for free updates from OCNJ Daily. 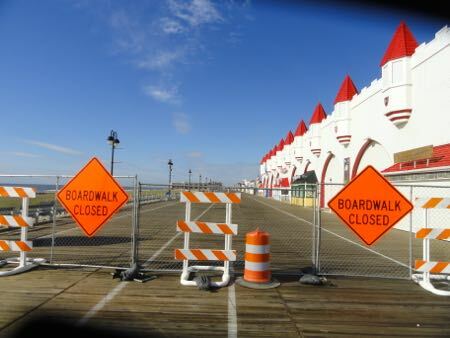 The Ocean City Boardwalk will be closed between Eighth Street and Sixth Street for about four months during a reconstruction project.